With the R11s, Oppo has once again produced a surprisingly premium handset that's capable of standing up to the big boys, making it an affordable alternative to high-end competitors like the iPhone X and Samsung Galaxy S8. Ever committed to giving consumers a flagship feel at a reduced cost, Chinese smartphone maker Oppo's latest handset is the R11s, a device that delivers a premium experience in almost every aspect of its design. While the original Oppo R11 was an exceptional mid-range phone, the Chinese electronics firm has managed to improve on it in every way with this new upgraded model. So much so, in fact, that it might even sway cost-minded consumers away from the likes of Apple and Samsung. In the West, the 6.01-inch R11s has only launched in Australia so far, where it's priced at AU$659 (about $518, £370). Those who prefer their handsets even more phablet-sized also have the choice of the Oppo R11s Plus, which has a 6.43-inch display and is priced at AU$779 (around $612, £438). In both instances, the phones are less than half the AU price of an iPhone X or Samsung Galaxy Note 8, which will be quite a selling point for many people. That said, despite sporting some high-end features, the R11s is undeniably a mid-range phone, as it lacks a few of the key aspects we've come to expect from flagship handsets. Still, if you can look past those shortcomings, the Oppo R11s offers terrific value. One of the key improvements that the R11s holds over its predecessor is a drastically-reduced bezel size, giving the phone a similarly-modern look to the Samsung Galaxy S8 and the Huawei Mate 10 Pro. 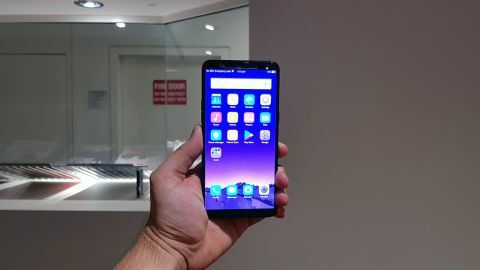 Those smaller top and bottom bezels (which are less than half of the size of what they were on the R11) mean Oppo's had to drop the physical home button that's featured on the front of pretty much every one of its phones up until this point. Instead, the company's now opted to use an on-screen navigation bar, while also moving the fingerprint sensor to the rear of the phone. Oppo's fingerprint sensors have always been incredibly fast, and the R11s is no exception, with the phone unlocking in what seems like a split second. Our favorite new feature? Face unlock, which was introduced on the Oppo F5 but seemingly perfected (or at the very least, greatly improved) here. We can't say for certain whether it's more or less secure than Samsung's own facial recognition tech, though. According to the disclaimer in the 'About Face Recognition' section of the phone's settings, Oppo states that "Your phone may be unlocked by someone with a similar appearance or objects shaped like you," which doesn't offer a whole lot of confidence. Still, we tried to fool our R11s with several selfies taken on another handset and couldn't get it to unlock. After three failed attempts, the R11s required the PIN to be entered. One flaw with the face unlock that was implemented on the Oppo F5 was that you had to hit the power button for it to kick into gear. The Oppo R11s has fixed that thanks to a 'raise to wake' feature, which bypasses this button press and means you only have to lift your phone up and face it for it to unlock. And the R11s' facial-recognition is so lightning fast that, on most occasions, you won't even see your lock screen. As is typical of most smartphones, you'll find the power button on the right side of the screen and a volume rocker on the left. It's got a combination dual SIM and microSD slot on the right side of its all-metal unibody chassis, which has such thin edges that it actually feel a little strange in the hand when the phone is naked. When its case is off (Oppo continues its much-appreciated tradition of including a clear gel phone case in the box), it also has a significant camera bump, made all the more noticeable by its wide, dual-camera nature. Music lovers will be happy to know that a 3.5mm headphone jack has been mercifully included on the bottom of the unit to the right of its Micro USB port. Yes, you read that correctly – it appears that Oppo isn't ready to jump on the USB-C bandwagon just yet. Along the top and bottom edges of the phone you'll find some fairly subtle iPhone 7-style antenna lines, which were barely noticeable on our black review unit. The Oppo R11s offers a hefty 64GB of on-board storage, and that can be expanded by a further 256GB thanks to its aforementioned microSD card slot. Likewise, the fact that the R11s already has a screen protector on it right out of the box is something we love. It's a thoughtful touch that saves customers from the hassle of purchasing and then awkwardly applying one themselves. It's the kind of practice we wish more phone manufacturers would adopt. The Oppo R11s may have more screen real estate available than its predecessor (the phone's display now takes up 85% of its front), but its resolution remains in the 1080p realm (2,160 x 1,080). Thankfully, it's got a gorgeous AMOLED screen with a pixel density of 401ppi, offering inky blacks, vibrant colors and exceptional brightness. In the past, we've noted Oppo's tendency to oversaturate the colors on its displays, but that isn't the case here. Want to get the best deal on an Oppo R11s in Australia? Compare prices on our sister site Getprice!